We talk to lots of people every day about Digital Marketing and Advertising. Typically most people are all about Facebook (which by the way is great! ), but I rarely if ever hear clients talk about wanting placements on Google Display Network. Why is this? Well, my theory is that Facebook is a known advertising platform and also that people only know about search ads on Google Adwords platform (Also VERY powerful). 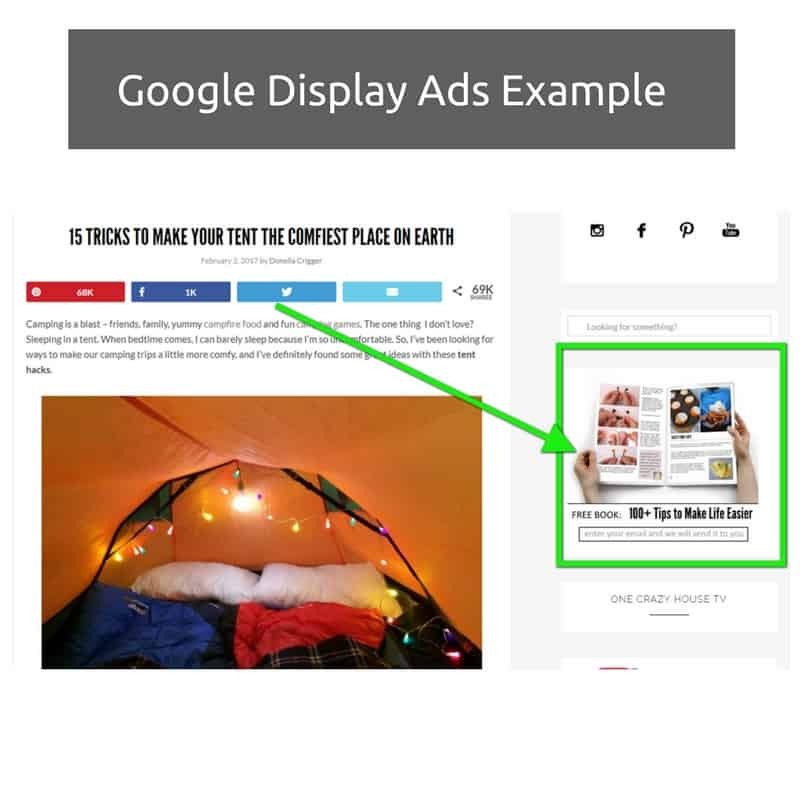 Many don’t know the power of Google Display Network Ads or even what it is for that matter. I am here to tell you - the targeting is even better than Facebook - and the ROI can be great because many people don’t understand how it works, therefore don’t put the focus into it like they do Facebook or Google Search Ads. Alternatively, the Google Display Ads, are those served when you are visiting a site that is on the VERY extensive network of Google sites. Meaning those sites that have “Adsense by Google” installed. This is a platform on a website that allows Google to advertise on the website. The last estimate I heard was around 3 million sites have “Adsense” installed. Crazy huh? See example below from camping website. So now to explain, why use Google Display Network? Well, every platform has advantages and disadvantages. Also, different platforms may be more effective for different business types but think of it this way. Facebook is one website to advertise on (although they also have a display network), Google Display Network has over 3 million websites to advertise on. Well, generally speaking, if you are running ads on Google Display Network you are able to get in front of people that are most likely in the market for your product or service. For the sake of example, back to camping, which I love by the way! 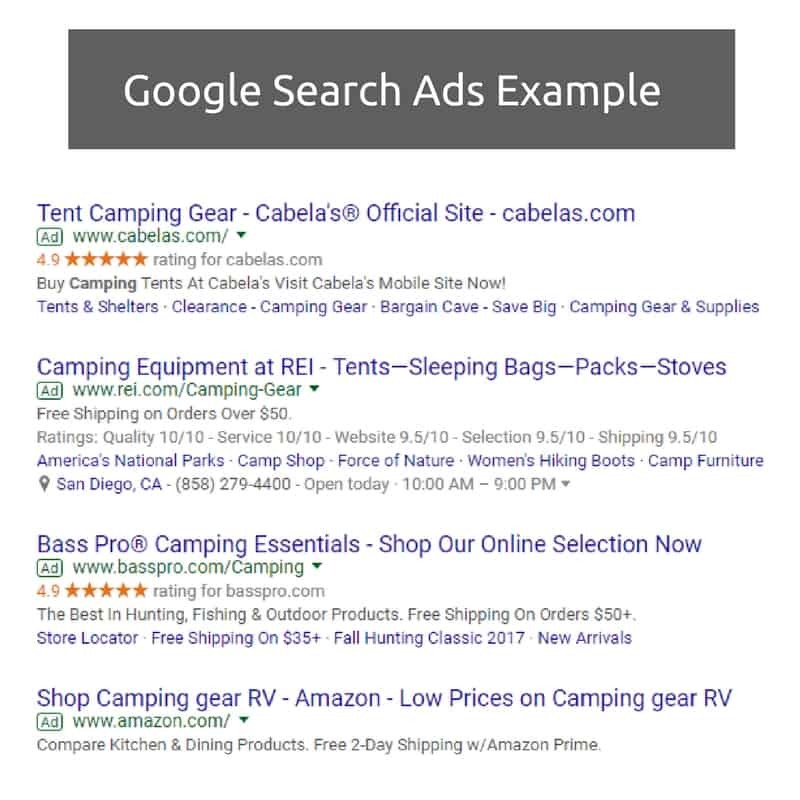 If someone is visiting blogs and consuming content surrounding camping, it's pretty safe to say that they are likely your market for campaign gear, camping courses, survival courses, etc, right? So if your ads are placed on sites that are adding value via content in your particular market, then BOOM there you go, your ads are getting in front of more of the right people. What are Google Display Network “In Market Ads”? Well on Google Display there are a variety of different targeting options, but I would argue that one of the most powerful is the in market targeting. This is exactly what I described above, people that are likely in the market for your product or service. So if someone is constantly visiting websites about travel, they are likely planning to travel, yes? This is the concept, getting in front of people that are consuming valuable content based on their in market needs. See below for a screen capture of the targeting fields and options. While this is just a snapshot, there are targeting categories for just about everything you can think of. At that point Google will pick websites for ad placements that make sense for your “In-Market” audience. Google is an extremely complex platform that is ALWAYS changing. These display ads have been around for quite a while, but they continue to improve them. The targeting gets better and better and the ROI for quality traffic to your website, is undeniable. While it can be a bit robust to get started, if you commit yourself to the cause it can be time VERY well spent. 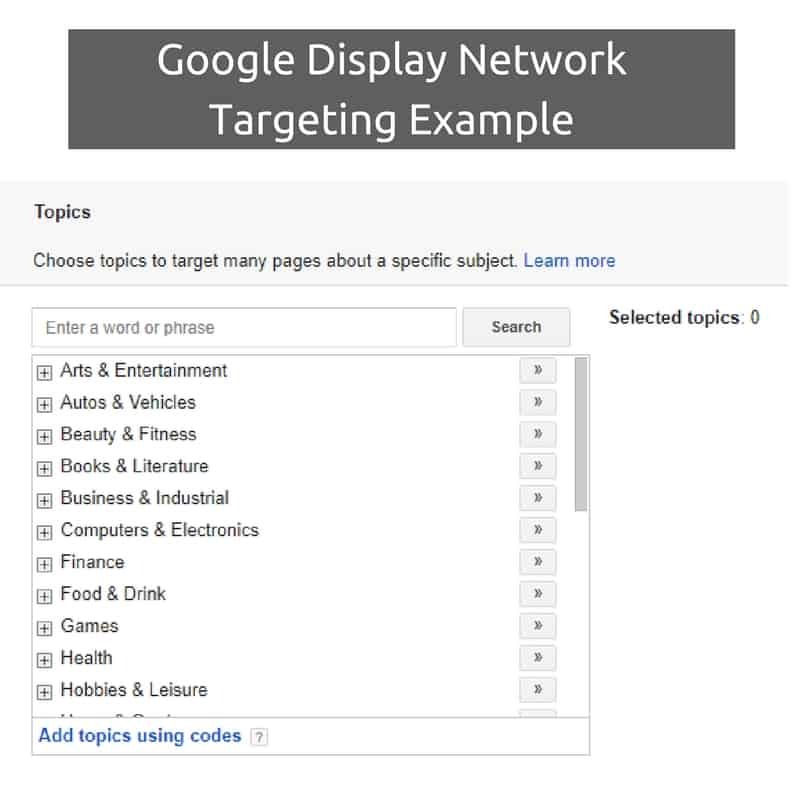 You can also find more tips on how to supercharge Google Display Network. Or, of course, you can always hire someone to manage for you….this ends my self-promotion I promise! On a serious note, if you are hiring someone to manage AdWords for you and they don’t know what display network is, run and FAST. Long story short, Google Display Network is very powerful, but many businesses either don’t know it exists or are scared to move forward. This is great news for you, as there is less competition than a platform like Facebook and arguably the quality of the traffic could be better, depending on your business niche. Hope this help! QUESTIONS ABOUT THIS ARTICLE? DROP US A LINE!